Released on video as "Reptilian"
I found this CD to be a curious, but overall enjoyable mixed bag of styles, including rock/vocal workouts, ballads, dance-pop and rap, as well as a few orchestral tracks. Many of the songs have English lyrics, and there are at least 4 different singers featured on this disc. I haven’t seen the movie, but I would bet that a lot of this music isn’t in it. The first track, "Revolution", is an energetic dance-rap anthem with a blend of Korean and English lyrics. The next song, "All For Love", is a power ballad with lush instrumentation and a syrupy male vocal. This is followed by more conventional score music - the "Main Theme" is a slow, regal-sounding orchestral march, in the John Williams/"Star Wars" or Jerry Goldsmith/"Star Trek" vein. Track 4 is another orchestral piece called "Yonggary is My Friend" - a sadder, string-laden theme that wouldn’t seem out of place in a sequel to "Close Encounters" or "E.T.". Track 5 is a complete turnaround, a hyper-sounding electro-rap song with a female vocal, choral background and a synthetic beat. The next track is a strange mixture of baroque harpsichord, sharp synth accents, pounding percussion and a yelping, over-reaching female vocal. This is followed by another dramatic but brief orchestral track, and then a pop ballad with a plaintive male vocal, a female chorus and monotone male chants over a shuffling beat. Track 9 is a short, dreamy piano piece, followed by a song called "Crying" - a power ballad with a suitably weepy female vocal backed with piano, synthesizers and a wailing sax. Track 11 is another brief orchestral cue, and Track 12 is a more classical-sounding tune featuring clarinet and strings. Track 13 is an energetic, orchestral rock workout with an overwrought male vocal and and melodramatic arrangement, reminiscent of Meatloaf's "Bat Out of Hell". The next piece, "Fighting Yonggary", is a short, regal horn cue peppered with English dialogue. This is followed by a reprise of the sad "Yonggary" string theme, which quickly mutates into a smooth jazz tune, complete with "Kenny G"-style alto sax. "Farewell to Yonggary" briefly revisits the earlier march theme with added film dialogue. "True Colors" is a catchy, bass-heavy pop song with a male vocal and English lyrics. The final track is an English version of "Revolution", with a slightly slower tempo and funkier beat. 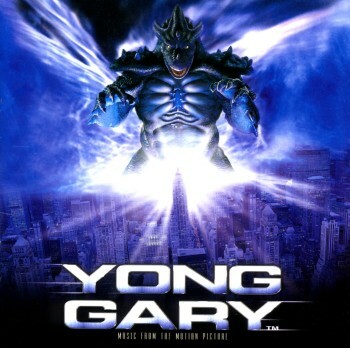 Stylistically, "Yonggary" is all over the map, and it’s hard to imagine much of this music in a giant monster film. Still, there’s enough variety on this disc to interest soundtrack collectors and sci-fi buffs, as well as some adventurous pop music fans. I Need Your Help, Holy!